The Centre for Policy Alternatives (CPA) recently held a workshop for political science students of the University of Jaffna, on the topic of ‘Youth Participation in a New Constitution’. More than 70 students and lecturers participated. This event, funded by the Friedrich Naumann Foundation (FNF) is part of a continuing drive by CPA to promote public engagement in the constitutional reform process and this particular workshop examined the current status of the constitution-making exercise in Sri Lanka. Topics discussed included the content of the six subcommittee reports on constitution-making, as well as the importance of sustaining the process of making a new constitution for Sri Lanka. 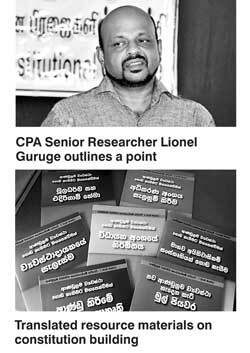 A number of relevant publications in Sinhala and Tamil, on constitution making, were distributed. Centre for Policy Alternatives Senior Researcher Lionel Guruge and Attorney-at-Law S.G. Punchihewa moderated the discussion, while University of Jaffna Head of Political Science Department Dr. Ganeshalingam also participated. Jaffna University Senior Lecturer Attorney at Law Y. Jothilingam also spoke at the event. You can engage further in the constitutional reform process and link with CPA’s Citizens Initiative for Constitutional Change through www.Citizenslanka.org or by contacting lionel@cpalanka.org.